JAMAICA, Queens (WABC) -- A Port Authority Police officer was struck by a suspect who was trying to flee at JFK Airport, the department tweeted out. 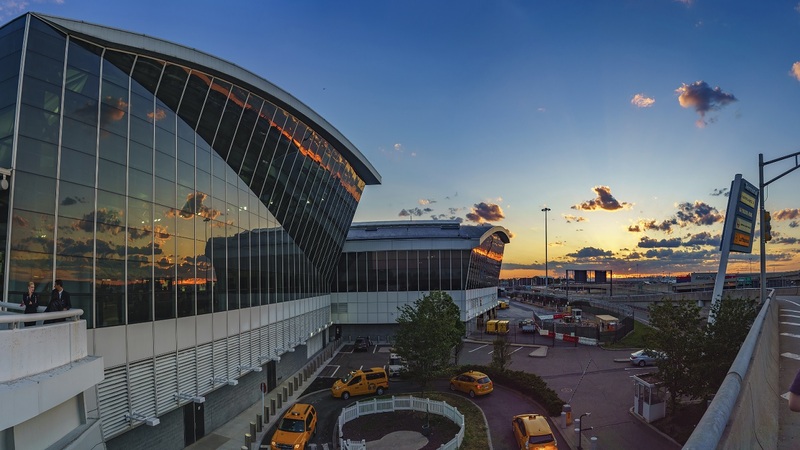 #PAPD cop struck by fleeing suspect's vehicle at JFK Airport. Cop taken to hospital, non-life threatening injuries. #THESACRIFICECONTINUES. Just after 5 p.m. Saturday, the officer, along with two other officers approached a parked car on the roadway of Terminal 8 arrivals. As officers were approaching the car, officials say the driver drove away, causing the female officer to jump out of the way. The officer then fell onto another moving vehicle. The suspect then fled from Terminal 8. The other officers ran toward the fleeing vehicle, and the suspect then backed up in the officers' direction, and fled onto the Van Wyck. Port Authority Police looked for the suspect, but could not find him. The injured officer was treated for minor bruises and soft tissue damage at the hospital.